The first American Legion commemorative coins came off the press Thursday during a ceremonial striking at the U.S. Mint in Philadelphia. Set to go on sale March 14, coinciding with The American Legion's 100th birthday, the silver dollar pays tribute to the organization's Paris founding. The coin's heads side, or obverse, has the American Legion emblem surrounded by oak leaves and a lily; the reverse has crossed U.S. and American Legion flags under a fleur-de-lis, with the dates 1919-2019 and the inscription 100 YEARS OF SERVICE. American Legion National Commander Brett Reistad attended the first strike, along with Past National Commanders Denise Rohan and David Rehbein, National Adjutant Daniel Wheeler, Marketing Commission Chairman James Rohan and Past Pennsylvania Department Commander Paul Kennedy. Also present were former House Veterans' Affairs Committee chairman Steve Buyer, R-Ind., and former U.S. Rep. Chet Edwards, D-Texas, who in 2017 rallied their congressional colleagues to support H.R. 2519, known as the American Legion 100th Anniversary Commemorative Coin Act. In addition to the American Legion silver dollar, the Mint will sell a $5 gold piece and a clad half-dollar. The gold coin's obverse features the Eiffel Tower and a V for Victory in World War I, with LIBERTY and 1919-2019 encircled by the outer ring of the Legion's emblem. On the reverse side is a soaring bald eagle and the American Legion emblem. The heads side of the half-dollar has two children, one wearing her father's American Legion cap, reciting the Pledge of Allegiance; the reverse shows a billowing U.S. flag and American Legion emblem above the words ... OF THE UNITED STATES OF AMERICA. Passed by Congress on Oct. 6, 2017, Public Law 115-65 allows the Mint to strike and issue 50,000 of the gold coins, 400,000 of the silver dollars and 750,000 of the half-dollars. The American Legion 100th Anniversary Commemorative Coin Act had broad support on Capitol Hill. The House version of the bill had 385 cosponsors -- more than any other coin bill authorized in the past decade. The commemorative coins were designed through the Artist Infusion program and U.S. Mint sculptors and engravers, in consultation with The American Legion, the Citizens Coin Advisory Committee and the U.S. Commission on Fine Arts. 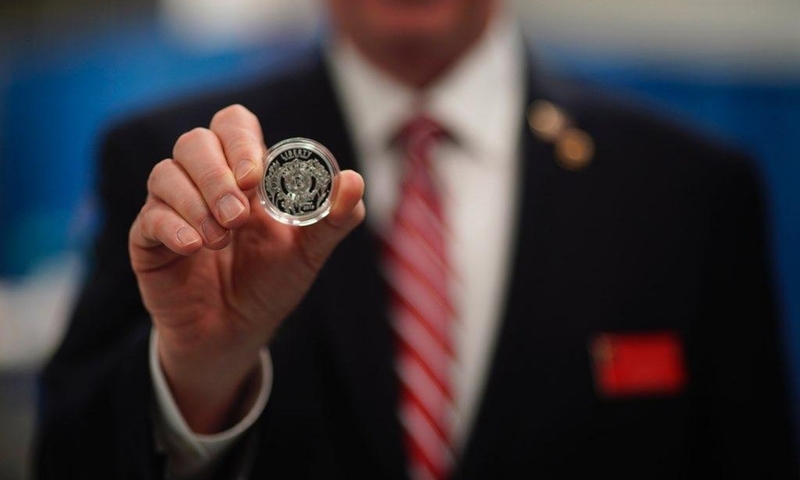 At the Legion's 100th National Convention in Minneapolis last August, U.S. Mint Director David Ryder said sales could raise up to $9.5 million for the organization's programs and services. To be added to the mailing list for updates, go to legion.org/coin. For prices and other ordering information, go to usmint.gov.